A new breed of teachers is born! Where those who CAN, Teach! This is really a story about the journey of 2 highly accomplished artists with a passion for sharing knowledge. Dean Collins (Founder of Software Cinema) and Colin Smith (Founder of PhotoshopCAFE). The 2 companies have joined forces to offer the best real-world online education available for creative people. Software Cinema is known for pioneering photography and lighting education and PhotoshopCAFE is known for their excellent Digital Imaging eduction for photographers and designers. With this combined strength, we have assembled the best and most talented instructors in the world. Bring the 2 together and you get something really special and unique (with close to 40 years of experience between the two). This training library is a result of this collaboration. (We still have a LOT of content to add, so stay tuned). Collins was a brilliant educator who became one of the most celebrated teachers of photographic lighting and camera technique. He began lecturing in his early twenties after beginning his career at Dunlap-Tierney Studios in the Los Angeles area, subsequently spending several years in Europe working with advanced commercial photographic studios. His audiences were treated to sophisticated multimedia presentations that predated the revolution in digital imaging by more than two decades. His uncanny way with words and his precise analogies entertained many thousands of photographers and designers for almost three decades. He was very effective in his ability to simplify complex thoughts for anyone to understand. 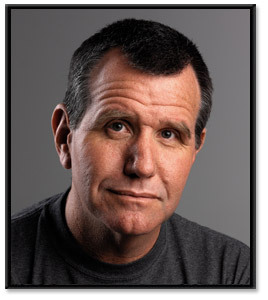 In the early 1980s he founded Finelight Publishing with partner Gary Burns and refined the publishing of photo lighting materials over the years, while conducting seven world tours. He was in demand as a speaker on every continent, and was often called upon to photograph heads of state, many of the world's best athletes as well as some of the most famous entertainers known. He developed several easily understood methods of controlling light and understanding its behavior, single handedly raising the level of competency and quality among a generation of professional photographers. The lighting in his photographs captured the attention of many. He produced many hundreds of virtual seminars and live "Training Camps", as he called them, bringing together the brightest teachers, the biggest brand names in photography, and enthusiastic crowds of practitioners in the U.S., Europe and Asia. In 1990 Collins began experimenting with electronic imaging, culminating in a very close association with Adobe Systems for over ten years. Today, Software Cinema produces a comprehensive collection of Photoshop and Design training resources. His longtime association with the Professional Photographers of America organization culminated recently in the bestowal of the prestigious ASP Award for Lifetime Achievement. Also, previously he was awarded an honorary degree from Brooks institute by Ernie Brooks. Dean Collins battled cancer for 3 years and passed away at his home in San Diego on February 2, 2005. He was 51 years old. He will be greatly missed by the industry. Colin Smith has worked professionally in the creative industry, where his passion for digital imaging caused him to rise quickly into Creative Director and Senior Editor positions. In 2005, he traded his corner office for a life of freelancing as a commercial artist with an esteemed client list that includes Satcchi & Satcchi, Proctor & Gamble, Toyo Tires, Microsoft and several Hollywood entertainment companies. His passion for sharing knowledge led to the creation of PhotoshopCAFE which quickly became one of the most popular online destinations for learning Photoshop and digital imaging (over 30 million visitors). Colin expanded his educational efforts onto the printed page and is a best-selling author of 19 books. 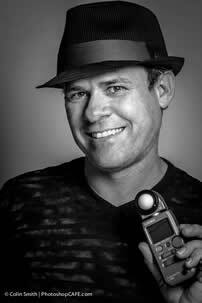 He has been featured in most major imaging magazines and is a regular columnist for Photoshop User Magazine. Writing wasn't enough for his entrepreneurial spirit, and Colin made the leap into video publishing and began the video publishing arm of PhotoshopCAFE. Colin recorded many hours of educational video and expanded into producing video initially from his close friends who also were the rare breed of successful artist and teacher. It was a natural progression to acquire the content rich Software Cinema and combine the resources of the two publishing companies. Working with top working professionals and educators resulted in a rich Library of video that is unmatched in its authenticity. Always reinventing himself, Colin is known as an award winning digital artist, photographer and designer (3 Guru awards among others) a pioneer of HDR photography and on the forefront of aerial drone photography. He has been nominated for the Photoshop Hall of Fame twice. Colin is in high demand as a platform speaker at conferences and major trade shows (Adobe MAX, WPPI, Photoshop World, CES, Imaging USA, to name just a few). He has conducted 3 successful United States seminar tours, (FSC with Lynda.com, Route CS6 and the sold out Destination CC tours, Sponsored by Adobe). He regularly conducts speaking engagements as an Adobe freelancer. Colin has consulted such companies as Adobe Systems, Edison International, Apple and Disney Studios.